Rita Walker makes vibrant, textured pottery. Her work often incorporates Austin themes such as nature and music. 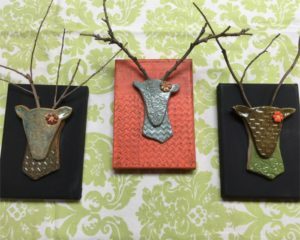 Many Austin stores carry her functional and decorative pieces, like these deer heads. Go to Austinot.com for the complete list of 11 uniquely Austin Gifts. Rita was spotlighted for starting the Cedar Park Free Art Movement in the summer of 2016.